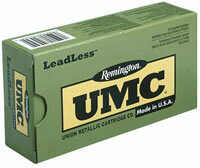 Details: UMC� LeadLess� cartridges virtually eliminate lead exposure at the firing line. The specially designed Flat Nose Enclosed Base (FNEB) bullet actually prevents the vaporization of lead from the bullet�s base upon firing. Also, these cartridges feature the industry�s best heavy-metal-free primer. Standard bullet weights duplicate the ballistics of conventional loads. And like all of our other UMC offerings, our LeadLess cartridges offer a truly economical value for high-volume shooters without any compromise in quality or performance.